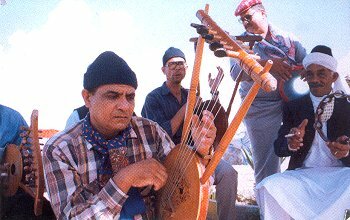 The simsimiyya is a lyre, an instrument at the heart of the lively urban popular music of the Egypts eastern Nile delta region, particularly in and around Port Said and Ismailiyya. This urhan 'folklore' (as it is often described in Egypt today) assumed its present form in the last quarter of the nineteenth century and the early years of the twentieth. The construction of the Suez canal brought laborers, entrepreneurs, administrative and military personnel from all over Egypt. Once opened in 1869, ships moving between the Red Sea and the eastern Mediterranean connected the regions adjoining these seas. The simsimiyya, reputedly carried on ships for good luck, slowly began to adapt itself to the peculiar social and cultural mix of the canal region. Musically speaking, this revolved around the street peddlers awaiting ships (whose distinctive style of dancing, bambutiyya, was named after the so-called 'bumboats' that plied the canal), and the suhbagiyya, rowdy groups of male musicians, that were the mainstay of caf� and informal concert life in Port Said at the time. 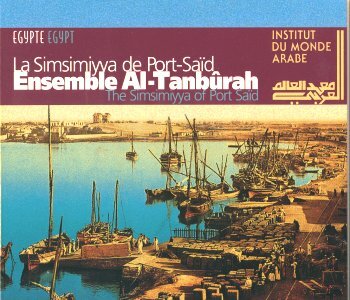 Simsimiyya ensembles of the kind heard on this recording subsequently assumed a 'folkloric' status as the Egyptian media began to dominate musical life from the early years of the twentieth century on. The genre, and the instrument associated with it, continued to change, however. The instrument was adapted to perform the maqam-based urban melodies of the north, rather than the pentatonic songs of the south. Extra strings and tuning pegs were added permitting fine-tuning of the strings to maqam pitches. On one recent Delta folklore program aired on Egyptian television, I saw a dismembered electric guitar functioning as an electrified simsimmiya, retaining the body and pick-up of the guitar, but with the neck removed, and the strings splayed out across the simsimiyya's characteristically trapezoidal frame. 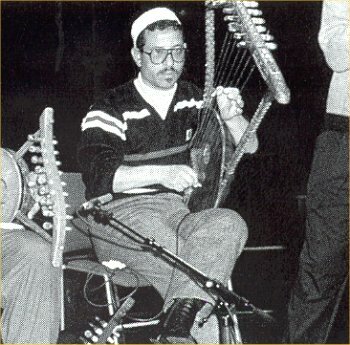 The simsimiyya repertory continued to absorb anything that could be performed on the instrument and was capable of entertaining a caf� crowd from various parts of Egypt and the eastern Mediterranean (hence developing a distinct kinship with popular muwashshahat and zajal from elsewhere in the region). The result today is that we hear a 'traditional' repertory of simsimmiya tunes that represents not inert 'folklore' from days gone by, but a decidedly lively and modern form of urban culture. Zakariya Ibrahim, the leader of the al-Tamburah ensemble, has repeatedly declared his interest in maintaining the simsimiyya musical tradition as lived and experienced in the locality, rather than coopted by the state. The Firqat al-Tamburah was founded in 1989 with this in mind. At a general level, Ibrahims firqa resembles other simsimiyya ensembles in the region. The words, though not in themselves humorous (they are, in fact a jumbled compilation of formulaic expressions of piety, love, admiration, folkish wisdom and naturalistic metaphors) assume a comic aspect in performance, more music theater than anything else. The robust sound of the chorus usually predominates, except where a rigorous call and response is being maintained, effecting a clear separationg between soloist and chorus. The simsimiyya is usually only clearly audible at the beginning of songs, though its warm, buzzing texture pervades the whole. Those songs known as damma and simsimiyya begin with a simsimiyya introduction; those known as jawab damma usually begin with an unmetered solo vocal introduction, known as istihlat. All are well represented on this recording. What, then, makes this recording different? I saw the ensemble performing twice during the summer of 2000 and got, as a result, some sense of just how and why the ensemble Al-Tambura have been so remarkably successful in making themselves heard beyond their immediate locality. The first occasion was in Port Fuad, a small city opposite Port Said, reachable by ferry. An audience of about 60 or 70 people crowded into the tiny and intriguingly named Cafeteria Enigma, one of a number on Port Fuad's eastern beach. All were local, of fairly modest backgrounds and clearly bent on enjoying a pleasant family night out on a cool summer's evening. The performance was studiedly informal, adapting itself to the space and to the audience, extending each number as the energy and enthusiasm of performers and audience permitted, and that was well into the morning of the next day. The second occasion was at the Cairo Opera, to a large crowd of perhaps 300 people, mostly young men, described to me by a Cairene friend as a university crowd. Zakariya Ibrahim was clearly determined to bring the Port Fuad caf� formula to the Opera stage unchanged, or as unchanged as possible. The same 'informal' style of presentation, the same everyday clothing (such as galabiyyas and jeans), the same cultivated roughness of presentation prevailed. Though the participants on stage seemed at first a little cowed by the surroundings, and the routines I had seen in Port Fuad a little stilted, rowdy audience support loosened them up. The last half of the evening proceeded with dancing, handclapping, and friendly heckling by the audience that characterize a successful baladi (urban popular) musical event in Cairo and elsewhere in Egypt. The positive and welcoming response of Cairene cultural elites and educated audiences was, then, the striking thing. This is clearly a moment in Egypt at which various new notions of 'folk culture' and its presentation to a broader audience are being explored. Ibrahim refuses to render local folklore as a historical document, as ethnically 'other' or as nostalgia for a past that never was. His alternative undeniably responds to some elements of urbanite fantasy, though it is equally clearly locally produced, locally managed, and profoundly responsive to local, rather than metropolitan, needs and energies. This CD recording is taken from concerts given at the Institute du Monde Arabe in Paris between 26 and 28 January 1996. It marks the IMA's thoughtful role in representing and promoting Arab culture in the France and the western world more generally. It also marks the increasingly international recognition of Zakariya Ibrahim's project, though perhaps also its limit. In this recording, as in the opera concerts, some of the flexibility and humor of the caf� context is lost. We don't get to see the dancing and physical horse-play, obviously enough, along with the games played as instruments are passed and thrown around. The cover of the CD (see illustration) suggests a historical document, whilst the inside cover (see second illustration) shows members of the group in an uncharacteristically serious pose. However, the engaging roughness and energetic humor of singing is still unmistakable, at least, to those who can follow the language. There are other advantages to this recording, too. Sophisticated sound recording equipment has allowed chief sound recording engineer Didier Panier to render the subtlety and complexity of the responsorial patterns, along with the relationship of the simsimiyya to the rest of the ensemble much better than is often the case in live performances in Egypt. The recording, in other words, sticks as closely to the original performance conception as is humanly possible, adding a thoughtful musicianly ear to a mixing process that still prioritizes voices and words, but enables the listener to attend to musical relationships that are sometimes obscured in local performance. The CD comes with useful and scholarly liner-notes by Christian Poche, well translated by Mona Khazindar. It will be a particularly valuable recording for those interested in exploring the regional diversity of Egyptian musics, and of specific interest to those concerned with the 'folklorization' of regional repertories by cultural elites, and local responses, in the Mediterranean world and elsewhere.